What can we conclude from examining the data? Perturbing the data can yield different ZBT signals, Even discounting the different versions of the ZBT buy signals, I think that everyone can conclude that we saw a bona fide ZBT buy signal last week. The question then becomes one of what subsequent returns were and how much can we rely on ZBT to take action in our portfolios. My conclusion, which agrees with Rob Hanna, is that the stock market tends to rise after ZBT buy signals. At worse, stocks didn’t go up, so a long position really doesn’t hurt you very much. The poor ZBT returns from the 1930’s represent a market environment from a long-ago era that may not be applicable today and therefore those results should be discounted. Investors and traders should not treat these models and indicators so literally. History doesn’t repeat, it rhymes. This is another reason why I am not a big fan of analogs. I recently referred to the 1962 Kennedy Slide as a possible template for the stock market, though I was thinking in terms of the bottoming pattern. 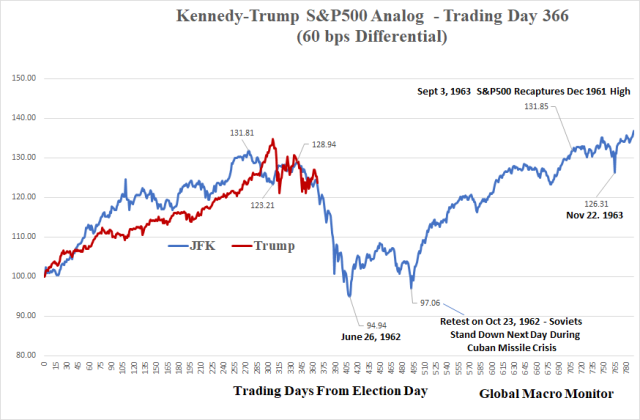 From a different perspective, Global Macro Monitor highlighted a 1962-2019 analog for the stock market, which was picked up by Zero Hedge (bless their bearish hearts). Does this look scary? Does this mean that the stock market is about to fall off a cliff, or is this just click bait? While I would never say “never”, but consider what happened in 1962. The so-called Kennedy Slide was the result of Kennedy going after the steel companies. He ultimately prevailed by sending in the FBI into steel company offices, and the homes of steel executives. The market panicked because it was anticipating what industries JFK would go after next. In other words, you would be betting on some catastrophic event like this as the base case scenario. While we recognize that such outcomes are risks, it is difficult to see how they represent the central tendency. Traders need to avoid the mindset that there is some magic black box that gives them 100% certainty. Here is one example from OddStats of how a historical study (N=17) with 100% certainty isn’t really a sure fire bet.. If you torture the data hard enough, it will talk, but should you believe everything it tells you, especially with a small sample size? 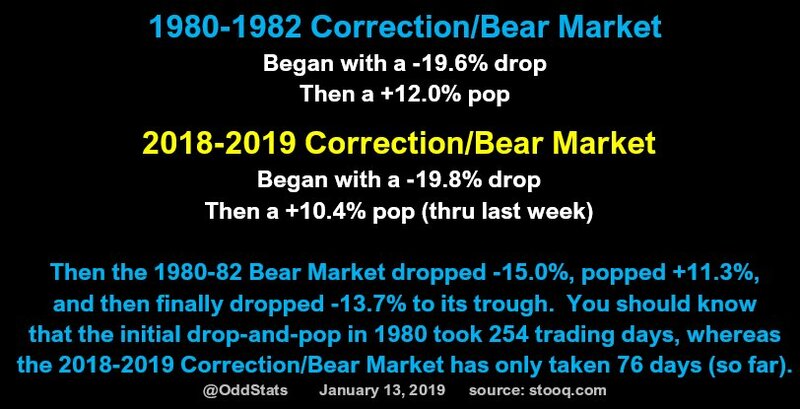 Here is another historical analog of the 1982 market compared to the 2019 market from OddStats. How much should you trust the historical pattern? A more sensible approach to an event like a ZBT is to recognize that it represents an unusual price momentum surge using historical analysis like this one from Troy Bombardia. Even then, traders should be wary of torturing the data until it talks. So far, the market has paused its advance earlier this week, and we may continue to see some near-term pullback or consolidation. If history is any guide, weakness should be viewed as buying opportunities, barring any unexpected cataclysmic news. I pointed out before (see A 2018 report card) that, regardless of how good the historical record of a trading system, you are making a bet somewhere. It is a truism in finance theory that you have to take on risk to be rewarded with higher returns, and if you don’t want to take a risk, then you earn the risk-free rate. All trading systems have vulnerabilities, and those vulnerabilities will fail at some point. That’s a feature, not a bug. There is no certainty in the markets. You can only profit by playing the odds in an intelligent and sensible fashion. Previous A State of Emergency for the markets too?